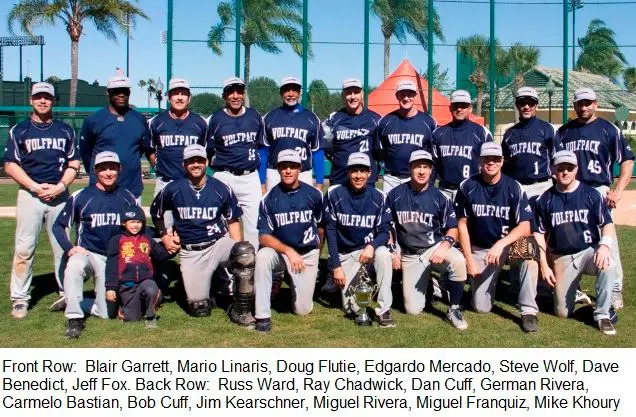 Orlando Florida, Jan. 20, 2014 — Jeff Fox had three hits, including a three-run double and scored twice, and Russ Ward had two hits and two RBI as the Boston Wolfpack powered their way to a 10-3 win over the Chicago Blue Jays in the 45-and-over finals. It was the Wolfpack’s ninth Disney crown in 14 straight appearances at the Holiday Classic, and their seventh title in a row. They have been runners-up at the tournament four times. Wolfpack starter and Fall Classic Hall of Famer Bob Cuff threw seven innings allowing nine hits, two runs. He walked one and struck out six. Dave Benedict closed the final two frames allowing one run on three hits. The Jays leapt out to a 2-1 lead after an inning-and-a-half thanks to Gary Sellergren’s two-run double in the top of the second inning that scored Mike Torresso and Dennis Weiner. The ‘Pack retook the lead in the bottom half of the inning on a squeeze play by Dan Cuff and a single by Miguel Franquiz. Franquiz was thrown out at second for the third out of the inning trying to stretch his hit into a double, but the run had already scored. Boston never looked back. They chipped away for two runs in the fourth, a run in the fifth, and four runs in the seventh inning. Fox and Doug Flutie, batting one and two in the order, both had two RBI’s in the back-breaking seventh. In addition to Fox and Ward, Franquiz, Flutie, Mike Koury, Dan Cuff and Dave Benedict also had two hits in the game for Boston. Tony Niezyniecki, Torresso, Sellergren and Tony Spohn all contributed two hits in the losing cause for Chicago. Boston entered the playoffs with a 2-1 record having lost to Fall Classic 52 American Champion Andrea’s Yankees in the second game. They defeated Westchester 9-1 in the first round of the playoffs behind a complete game by Flutie, and then vanquished the Jacksonville Vikings in the semifinals 9-4 in a 16-hit attack. The Wolfpack outscored opponents 55-19 on the weekend. Chicago slid into the playoffs with a 1-2 record counting losses to Andrea’s and the Wolfpack. They beat a tough Maine Diamond Dogs team 5-4 in the quarterfinal, and then took care of the Nassau Yankees in the semifinal 13-6. Mario Linaris, who caught all 6 games in temperatures ranging from 38 degrees to 70 degrees while batting over .400, was named the Wolfpack’s MVP. Fox led the Pack hitting a remarkable .609 for the tournament.